India has about 7516.6 kilometres of seashore & it is one of the biggest peninsulas in the world. 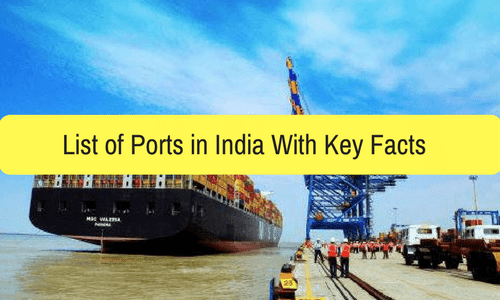 It has 12 major ports & around 200 notified minor & intermediate ports. Maharashtra with 48 docks has the maximum number of non-major ports trailed by Gujarat with 42 docks & Andaman & Nicobar Islands with 23 docks. The Central government’s shipping ministry will take care of all the major ports. The Minor & Intermediate ports will be taken care by the relevant departments in the coastal states. Kandla Port is situated on the Gulf of Kutch. It is the biggest port of India by volume of freight handled. Mormugoa port is the foremost iron ore exporting port. Panambur is the location of sea port called New Mangalore Port. It is an all-season port. Paradip port is an artificial & deep water port. Ennore Port is also known as Kamarajar Port Limited & is the only major port registered as a company. Jawaharlal Nehru port is previously known as Nhava Sheva Port & is the largest container port in India.